Dr. Sumit Kumar Gupta Dean, Faculty of Science Parishkar College of Global of Excellence Jaipur in the Department of physics, With over 15 years of teaching, research, and administrative experience, he has held various administrative positions as the Head of Department in various degree colleges and engineering colleges and has a vast experience of teaching in IIT-JEE. 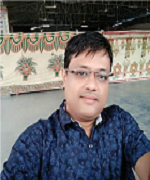 Dr. Sumit Kumar Gupta had been associated with Maharishi Arvind Institute of Engineering and Technology, Jaipur for last 8 year as Associate Professor. Prior to that, he was associated with Agarwal PG College, Subodh PG College, Global Institute of Technology, Joythi Vidhyapeeth University Jaipur, as faculty positions for 7 years.He has been selected as Speaker keynote in 3 International Conference in material science 2017, London Dubai, & USA .He has written 7 books for B.TECH engineering. He has been appointed as 7 International editorial Board member in UGC approved Peer Reviewed, Thomson’s Reuters International Journals .He guided 12 M.sc (physics) Projects, 3 MPhil (Physics) thesis, 10 MTECH Projects and 4 students on going Ph.D. my Supervision. 10 students has published international paper in UGC approved Peer Reviewed,Thomson’s Reuters my Supervisions.